What is the State of Hate?What is the State of Hate? What is the State of Hate? Hate impacts everyone and leaves no community highlighted in the Communities Against Hate initiative behind. We see this in our data. We also see that the current political climate impacts the state of hate given the troubling findings in our database of the number of incidents of hate committed where the name or idea of an alt-right hate group, President Donald Trump or Trump-related rhetoric, or other hate groups were invoked. This report analyzes 3,656 hate incidents from the CAH database that were said to have occurred between November 2016 and May 2018. Multiple codes can be selected per incident. A bias motivated incident committed, in whole or in part, because of actual or perceived race, color, religion, national origin, gender, sexual orientation, gender identity, disability, and/or ethnicity. Hate incidents may or may not constitute a crime. Our analysis of the incidents reported to the Communities Against Hate database seeks to provide a better understanding of hate incidents occurring today. The types of incidents reported include physical, verbal, and written abuse; refusal of rights; stolen property; intimidation; and sexual intimidation or harm. 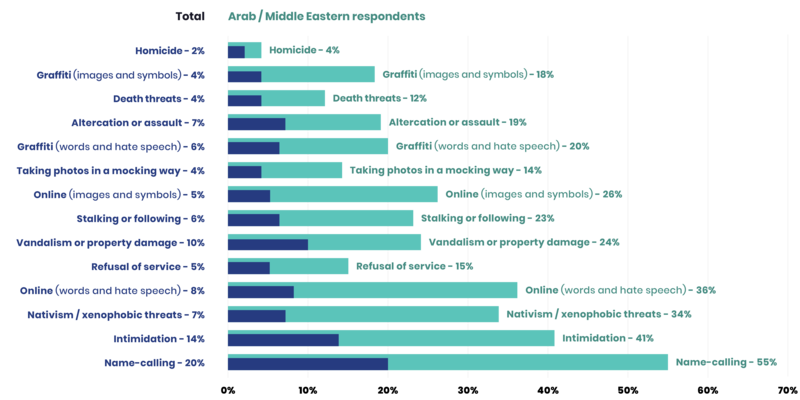 This report outlines an analysis of the hate incidents2 in the Communities Against Hate (CAH) database and the findings of our Hate Incidence Poll. Hate incident is here defined as: A bias motivated incident committed, in whole or in part, because of actual or perceived race, color, religion, national origin, gender, sexual orientation, gender identity, disability, and/or ethnicity. Hate incidents may or may not constitute a crime. 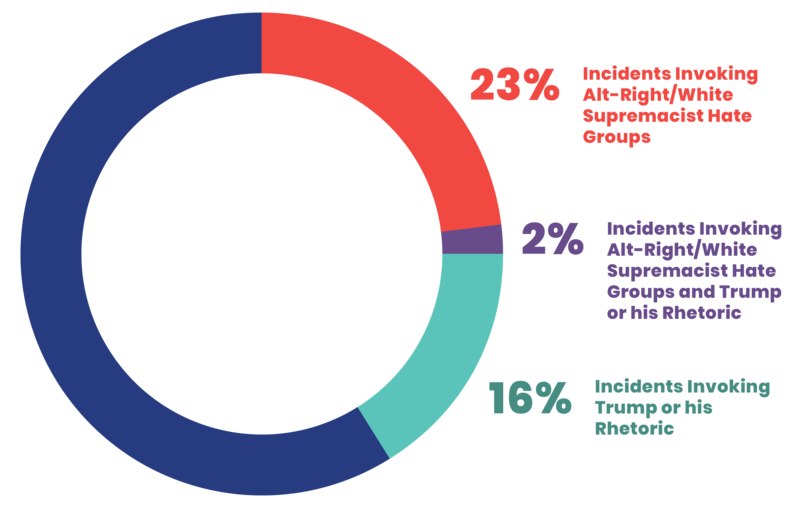 The Hate Incidence Poll finds that 43 percent of total respondents state that they experienced or witnessed a hate incident in the past two years. Of those respondents, 47 percent are Black, 59 percent are Hispanic, and 73 percent are Arab/Middle Eastern. The CAH database showed similar reporting as it relates to demographics impacted, with anti-Black/African-American biases being present in 858 (23.47 percent) incidents. Anti-Muslim was selected in 542 incidents (14.82 percent). Anti-Latino/Hispanic was selected as the motivation in 332 incidents (9.08 percent). Similarly, a majority of Hate Incidence Poll respondents (66 percent) stated that the perceived motivation behind the most significant incident was race or ethnicity. Religion was third most selected at 35 percent in the poll. Q23. Thinking about the past one or two years, have you ever personally been a target of a hate incident? Q24. In the past one or two years, have any of your family or friends been a target of a hate incident that you are aware of? Q25. And again, in the past one or two years, have you ever witnessed a hate incident take place that was happening to a stranger? The most recent data from the FBI documented that hate crimes increased by 17 percent, making it the third consecutive year that reported hate crimes have increased. From our findings, it is clear that people are experiencing hate in alarmingly high numbers. This conclusion was further reinforced by the FBI in November 2018, when it released its annual report on the hate crimes data it received in the previous year. The most recent data from the FBI documented that hate crimes increased by 17 percent, making it the third consecutive year that reported hate crimes have increased. This FBI data almost certainly understates the true numbers of hate crimes committed as victims/survivors may be fearful of authorities and thus may not report these crimes to law enforcement. For that reason, these numbers only begin to paint a picture. 2. Of the nearly 4,000 incidents in the CAH database, 93 percent of them (3,656) are hate incidents. The most common trend of a hate incident in the CAH database is through the use of language. The most common trend of a hate incident in the CAH database is through the use of language. The plurality of incidents, at 41.47 percent in our database, reflects incidents of spoken abusive language in which an individual has been called a slur, told to “go back to their own country,” given a death threat, or been the target of other threatening or demeaning language. Individuals also commonly report experiencing or witnessing written abusive language either in the form of graffiti, threatening mail, online commentary, or other forms. 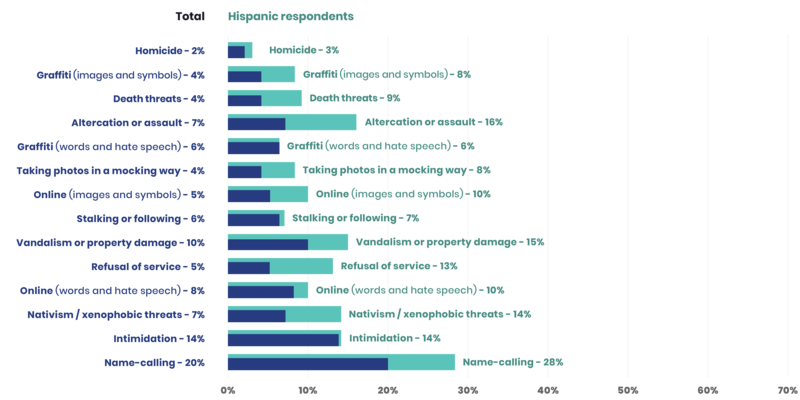 Respondents in the Hate Incidence Poll were asked to comment on the most significant incident of hate they experienced in the last two years. Consistent with what we have found in the CAH database, poll respondents who experience hate say that the action that occurs most often is written or verbal abusive language (57 percent) including online words or speech, name calling, graffiti words and speech, online images or symbols, photos or videos, or graffiti images and symbols. Twenty-two percent of Black, 28 percent of Hispanic, and 55 percent of Arab/Middle Eastern respondents say they experience or witness “name calling.” Additionally, 13 percent of Black, 14 percent of Hispanic, and 34 percent of Arab/Middle Eastern respondents say they experience nativist or xenophobic threats. Hate incidents often are perpetrated with multiple forms of attacks within one incident. Many respondents who report to the CAH database note that they experience or witness incidents that include multiple actions. 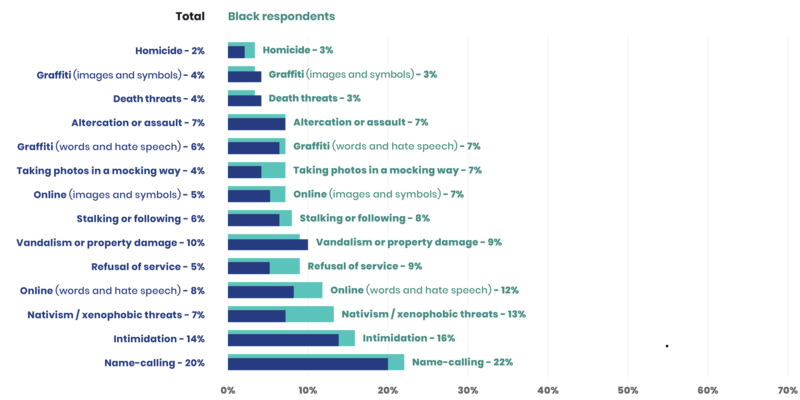 The highest concurrent actions are written abusive language with property damage (17.01 percent), typically represented as vandalism. For example, in one incident, swastikas and other symbols were drawn with sharpie markers all over the hallways of a housing complex where mostly people of color and immigrants live. In one example, aggressor(s) vandalized a mosque with hate speech, urinated on the carpet, and stole money from the donation boxes. In this incident, the aggressor chose to attack the Muslim community by desecrating their place of worship while also communicating written abusive language on the mosque itself. The multiple actions in this incident confirm that the aggressors were targeting the mosque as an act of hate while also disrespecting and endangering the individuals who worship there. The next most common co-occurring action in the CAH database is spoken abusive language with physical harm (9.98 percent). For example, an individual sitting in his car was physically attacked while aggressors referred to him as a “terrorist.” He lost consciousness during the attack, and when he woke, his car had been stolen. A student of mine was assaulted yesterday morning inside of [a business] close to our school. That student is a transgender female and a senior at our school. Prior to the assault, multiple eye witnesses reported hearing that the alleged assaulter could be heard saying clearly ‘I'm going to beat that tra***'s a**.’ She sustained serious injuries to her face and required multiple stitches. This report does not exist to indict any individual or political party as the cause for hate but to provide data that illuminates what animates people to commit an incident of hate. To that end within the CAH database, during some incidents, invocations of politicians or hate groups are made to indicate the incident was on behalf of Trump or alt-right hate groups. Overall, a total of 1,444 hate incidents invoke the name of an alt-right hate group, Trump or Trump-related rhetoric, or other hate groups. Alt-right hate groups are invoked in 848 incidents (23.19 percent) and more commonly invoked or referenced in written abusive language (20.51 percent). While Trump is invoked in 16.30 percent of incidents, these invocations are more commonly expressed in spoken abusive language (9.51 percent). There are 91 database incidents (0.6 percent of all incidents that invoke Trump or hate group rhetoric) in which both an alt-right hate group and Trump are invoked and these mostly take the form of graffiti. As I was walking outside, there was a truck doing donuts near my car, so I was trying to hurry and get outta there before they noticed me. I was going to unlock the door and I heard them yell ‘hey n****r b***h! Get back on the boat back to Africa, and get the f**k out of America! This is the White man's land! Make America WHITE again!’ I was just standing there, completely shocked at what I had just heard. Before I could even process the situation, they had threw (sic) 2 gas station cups full of what I thought was soda all over me as they drove off screaming more obscenities. I got into my car and locked the doors, and began sobbing. It wasn't soda, it was all their spit from chewing tobacco mixed with some other nasty stuff. To relegate to an unimportant or powerless position within a society or group. A group of White male students gathered around a pick-up truck with a confederate flag decal in the high school parking lot shouting '"grab her by the c***, f*** her up, Trump Trump Trump," while a mixed group of African American, Hispanic and White female students walked into school. There have been weekly sightings of white supremacist posters in [city] since January of this year. They are often found in majority Somali neighborhoods and are causing the students and community members to fear for their safety. The most common type of incident referencing an alt-right group reported to the CAH database includes vandalism and written abusive language involving swastikas and other alt-right symbolism and statements (e.g. graffiti of trash bins, flyers put up around campus). For example, one individual reported: “Our recycling bins in our alley behind our home…were tagged with swastikas overnight. My husband is Jewish, my two children half-Jewish, so this is particularly concerning. Our neighbors' garage was tagged with swastikas as well. They are Muslim.” Of incidents referencing alt-right hate groups reported to the CAH database, the most common references are made to Nazism (including swastikas or references to Hitler or neo-Nazi groups) and the Ku Klux Klan (KKK). Nonetheless, incidents that include references to newer alt-right groups, such as Identity Evropa and True Cascadia, are also reported. Many people who are victims of hate incidents that include a reference to Trump or a hate group indicate feelings of fear, disgust, discomfort, and anger or frustration. It is easy to see how hate incidents invoking an alt-right hate group known for targeting individual people, often in the form of in-person attacks or vandalism, might generate fear. In addition to making the targeted individual fearful, alt-right hate group fliers also often generate fear throughout the greater community. For example, an incident read, “There have been weekly sightings of white supremacist posters in [city] since January of this year. They are often found in majority Somali neighborhoods and are causing the students and community members to fear for their safety.” In the CAH database, invocations of alt-right hate groups are far more common to occur at universities (third highest among all invocation of alt-right hate groups). The CAH database includes several entries that report on the plastering of recruitment or otherwise inflammatory posters at university campuses across the nation, showing a potential trend of recruitment specifically on college campuses (e.g. Identity Evropa flyers were found on campuses in South Dakota, Illinois, and Alabama, among others). Motivation for incidents in the CAH database is determined at the point of intake of the form by the individual who witnesses or experiences a hate incident. Motivation is used to determine who is impacted by the incident. It may also be interpreted by the database manager or by the hotline manager, if not explicitly stated. Incidents of hate can happen anywhere. Recent hate crimes have taken place at houses of worship, social gathering spots, at the grocery store, and even online. Businesses are the next most common location for reported incidents, with 532 incidents occurring at a business location (14.55 percent). Many reported incidents also occur at private residences (475 reported incidents or 12.99 percent). In considering the action in the CAH incidents by the most common location it occurred, property-related incidents, including property damage, leaving a symbol, stolen property, and written abusive language occurs most frequently at private residences. Most of these incidents affect individuals waking up to find their home graffitied, such as in one incident where a couple woke to find their neighbor’s house was vandalized with KKK/Nazi propaganda. 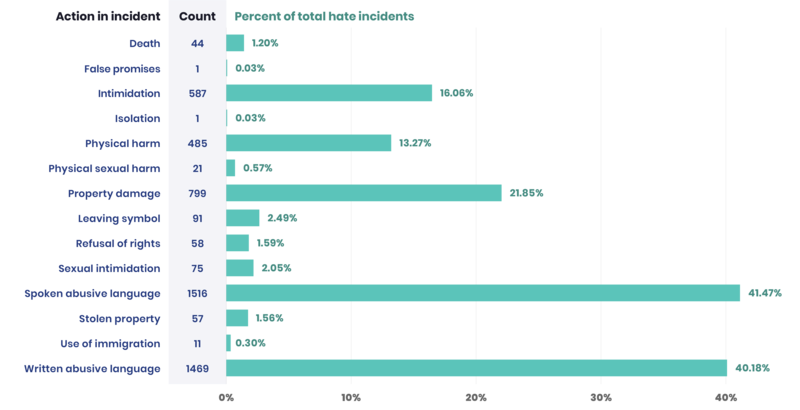 This report analyzes 3,656 hate incidents from the CAH database that were said to have occurred between November 2016 and May 2018. Multiple locations can be selected per incident. The database and poll show alternative locations as to the most frequently selected locations in which hate incidents occur. The database shows that hate incidents most commonly happen on the street, while the poll reports that most individuals report the most significant incident they experienced was online (after “other”). The database and poll show alternative locations as to the most frequently selected locations in which hate incidents occur. The database shows that hate incidents most commonly happen on the street, while the poll reports that most individuals report the most significant incident they experienced was online (after “other”). The difference in the most commonly selected locations for these two different collections of data could be that the database relies on action taken by an individual after a hate crime occurs by requiring the individual or a witness to take the initiative to report the incident, while individuals in the poll simply answer questions based on hate they experienced. Some may feel that online hate is not worth the time to report but would still count it as a hate incident if they were asked by an individual inquiring about hate incidents they’ve experienced. The difference here between the most commonly selected location between the poll and the database shows that more hate incidents likely occur and pervasively affect individuals’ lives than they report. Individuals reporting incidents to the CAH database often report feeling afraid, confused, angry, or sad while experiencing or witnessing the hate incident. Everyone was looking at me with pity or something akin to that … I felt so angry and humiliated. Many people were standing there and no one said anything and I felt humiliated and shamed. I should have said anything but I did not want to seem rude. I was crossing the street and some guy in a [car] drove by me and yelled out, ‘F**ing n***, go back to Africa...the slave ship is loading up...TRUMP!’ Everyone just looked at me and I bowed my head in embarrassment not saying a word or reacting to his words and continued to my car. I was so incredibly deflated that I couldn't work for two days. I called my mom crying. Occasionally, the CAH database finds that fear is offered as a reason for individuals choosing not to report or to share in the incident with authorities or authority figures. For example, one woman was repeatedly harassed by a group of men on public transportation and accused of pushing someone. The woman felt ashamed and frustrated, stating that during the incident few would stand up for her and, “Everyone was looking at me with pity or something akin to that … I felt so angry and humiliated.” Other common emotions include anger. For example, a pedestrian insinuated to a woman that she must not understand how to read English. She responded to the man to mind his own business, and then she, “… continued walking the trail fuming inside.” The findings in the Hate Incidence Poll are consistent with the feelings expressed by people in the CAH database. Poll respondents associate anger (40 percent of respondents), sadness (25 percent of respondents), and frustration (24 percent of respondents) with the most significant hate incident they experienced or witnessed. Sometimes this shame is expressed in the CAH incidents as something that is nearly uncontrollable, or an individual feels unable to respond due to social norms. A young girl’s backpack got stuck on a woman’s shopping bags. The woman violently ripped her bags from the young girl’s bag and said, “Why are you people like this?” The young girl further wrote in her response, “Many people were standing there and no one said anything and I felt humiliated and shamed. I should have said anything but I did not want to seem rude.” In another example, an individual was shopping when they said the following occurred: “I was crossing the street and some guy in a [car] drove by me and yelled out, ‘F***ing n****, go back to Africa...the slave ship is loading up...TRUMP!’ Everyone just looked at me and I bowed my head in embarrassment not saying a word or reacting to his words and continued to my car. I was so incredibly deflated that I couldn't work for two days. I called my mom crying.” In these incidents, either shock, social situations, fear for safety, or physical lack of ability to respond leaves individuals ashamed and crushed. Another source of strength rests in people’s values and their desire to see the triumph of those values or sentiments expressed. For example, one story in the CAH database tells of an aggressor who draped a noose over the campaign sign of a candidate in an upcoming election. The candidate responded, “We have to say we're not going to tolerate this hate in our community. It's not going to intimidate us. We need to stand up for the values we believe in.” Seeing the strength that impacted individuals espouse offers hope for those who have been impacted and an opportunity for communities to band together to support one another after hate has impacted the community. "We have to say we're not going to tolerate this hate in our community. It's not going to intimidate us. We need to stand up for the values we believe in."